Pokemon Go, a game for iOS and Android smartphones about wandering around and catching Pokemon, is in the process of being ported to the Dreamcast VMU, a device the size of a single Doritos chip and not much more powerful than one. And who is responsible for this? Someone going by the online handle "guacasaurus_mex," according to Ars Technica. I couldn't make this up if I tried. Obviously the VMU lacks both the graphical punch and processing power of today's smartphones, so the game will be streamlined for the 48x32 resolution portable memory card. A randomly-generated map will be used instead of GPS coordinates, and a timing-based mini-game will be used to capture Pokemon instead of swipes. Mex has also created a racing game and proof of concept for a turn-based fighting game based on Star Wars: The Force Awakens. Holy crap! 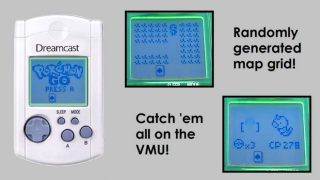 I started writing this article thinking it would be one cute little side project, but the VMU homebrew scene is freakin' awesome. Godspeed, Mex - we'll be waiting for your Pokemon Go VMU port and any other wild ideas you dream up.